The Arduino Esplora is like the Arduino Leonardo but packed with sensors, buttons and other useful features already wired up. This leaves you to learn and experiment with the Arduino system without having to worry about electronics first. It is instantly obvious that it is laid out like a game controller with a two-axis analog joystick with central push-button, and 4x push-buttons in a diamond shape, but it has a lot more to offer. Whether you're a beginner buying your first board, an experienced user looking to do some lone coding, or want a good, portable development system for when you're on the move, then the Esplora is for you. 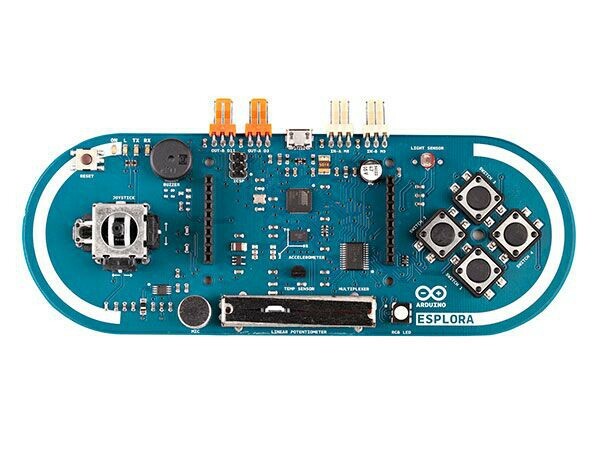 The other inputs on the Esplora include: a linear slider potentiometer, microphone, light sensor, temperature sensor, and a three-axis accelerometer, built and tested and ready to go. The outputs include a buzzer, and a bright RGB LED. Along the top edge you'll find 2x TinkerKit outputs and 2x TinkerKit inputs giving you access to the growing range of TinkerKit modules. In addition, the Esplora's built-in USB communication enables it to appear as a mouse or keyboard to a connected computer, greatly enhancing the versatility of this Arduino device.The two central header strips are for a colour TFT LCD such as 73-4740, but any device that uses the SPI protocol could be used. Add a battery and you have a fully portable device, which is even better with the LCD. Use it on the move, with just your laptop or Arduino tablet (requires USB OTG) for an uncluttered development/test system without the usual baggage of breadboards, wires etc.. The Esplora is supported out of the box by the Arduino IDE with a comprehensive set of examples for beginners and experts. EsploraBlink : Blink the Esplora's RGB LED. EsploraAccelerometer : Read the values from the accelerometer. EsploraJoystickMouse : Use the Esplora's joystick to control the cursor on your computer. EsploraLedShow : Use the Joystick and slider to create a light show with the LED. EsploraLedShow2 : Use the Esplora's microphone, linear potentiometer, and light sensor to change the color of the onboard LED. EsploraLightCalibrator : Read the values from the accelerometer. EsploraMusic : Make some music with the Esplora. EsploraSoundSensor : Read the values from the Esplora's microphone. EsploraTemperatureSensor : Read the temperature sensor and get the temperature in in Farhenheit or Celsius. EsploraKart : Use the Esplora as a controller to play a kart racing game. EsploraTable : Print the Esplora sensor information to a table format. EsploraRemote : Connect the Esplora to Processing and control the outputs. EsploraPong : Play Pong with the Esplora using Processing. Weiterführende Links zu "Arduino® Esplora"